With white sand beaches, fantastic dive and snorkel sites nearby, an exotic swimming pool, on-site gym, lush gardens and a 5-star service package that includes grocery delivery, massages, fine wine and private chefs …… Indigo offers everything you need for the perfect vacation. 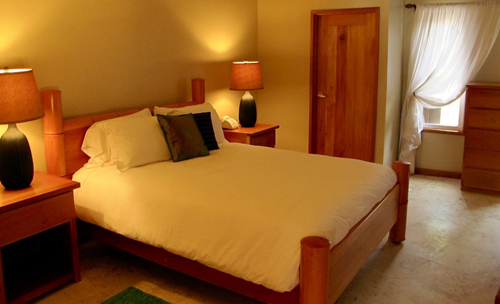 Indigo is located in the ‘Mata Grande’ neighborhood of the North Beach area of Ambergris Caye. The area is peaceful and picturesque, comprising a handful of privately owned homes, a couple of elegant boutique resorts, some fine dining establishments, a local grocery store and a fun beach bar serving local BBQ, all within walking distance. All suites at Indigo have unobstructed views of the ocean and Belize Barrier Reef, together with all the modern conveniences for a luxurious and comfortable stay. Indigo is a collection of luxurious private residences and the resort has an on-site caretaker, management and dedicated concierge to take care of all the details to ensure your stay is as effortless and memorable as possible. Your concierge will happily liaise with you in advance or during your stay to make arrangements for tours, excursions, private chefs, provisions, in suite spa treatments and much more. The Grand Suites at Indigo are the largest suites available and boast 2,650 square feet of luxurious indoor and outdoor living space. You can walk out onto your 180 degree sweeping veranda from the kitchen, lounge and also the master bedroom, with spectacular views. The perfect place to grab your morning coffee and watch the sun rise over the barrier reef. Take your pick from the penthouse for panoramic views of both the ocean to the front and the lagoon to the back, or opt for the ground floor suite and enjoy instant access to the sand. The Beach Suites at Indigo are right by the water’s edge, with unobstructed 180-degree views of the Caribbean sea to the north and south. You will be closer to the water’s edge than you can imagine, where you can fall asleep to the sounds of the waves crashing on the barrier reef offshore. These suites further benefit from private verandas accessible only from the master bedroom, ideal for a quiet escape and peaceful sundowners. The Oasis Suites at Indigo surround the tropical swimming pool and enjoy stunning views of the ocean and reef. They benefit from a more substantial great room and verandah, creating a perfect place for cooking and entertaining…. or have a private chef come and do the chopping whilst you do the chatting. The circular open plan great rooms at Indigo and large verandahs are the perfect places for dining with friends and family. Your concierge can arrange for food and drinks to be delivered before and during your stay, or sit back and let a private chef do all the work for you. Your concierge works with various private chefs offering differing styles of cuisine and formality. Whether a Belizean banquet, a fresh fish BBQ or a gourmet international chef’s table, it can all be arranged. A 15 minute walk to the south is Rendezvous Restaurant, a quaint Thai / fusion restaurant offering ‘cuisine exotica’ – beautifully prepared and presented tasty appetisers, the day’s fresh catch, carnivore’s special and their must try signature pad thai noodles. Glenn and Colleen have been at Rendezvous for 13 years and are warm, welcoming and fun hosts. A ten minute walk to the north of Indigo is Sundiver Beach Bar, a fun little palapa bar by the water’s eadge with a deli serving local treats such as salbutes, tostadas, fish sandwiches, and more. The hours are 11am to 4pm for food so a great spot for lunch. Further north is the award winning Rojo Lounge at Azul Resort, a hip and loungey spot with a killer cocktail list. Chef Jeff’s ‘tropical lounge cuisine’ has won Fodor’s Choice 5 years running. Mambo at Mata Chica Resort, next door to Rojo, has an eclectic international menu, friendly service and even a complimentary boat that will collect and return you to your dock – your concierge can arrange this for you. Rates are quoted in US Dollars per unit, based on a maximum of 6 people staying in a unit, including a welcome basket of provisions and goodies, daily housekeeping, concierge and transfers from San Pedro as required. Rates subject to 9% government hotel tax and 5% service charge. 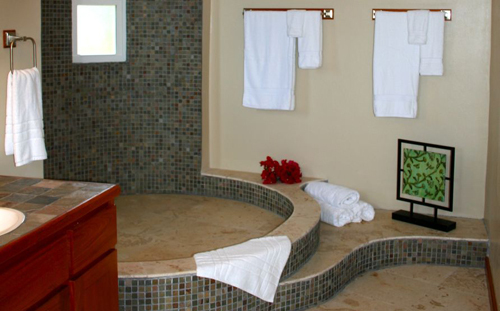 Talk to us about couples special rates, multi suite booking discounts and last minute specials. A place to get away from everything and just relax – “A beautiful place to just relax and unwind, just north of San Pedro on Ambergris Caye. When we got there the first thing we did was pull out the hammock, hung it up at the end of the pier and just relaxed. We soaked in beautiful blues of the Caribbean sea and the view of the Belizean reef just a 1/4 mile out. Next on the agenda was to get into our swimsuits and grab our snorkeling gear, put our faces in the water. Were astonished at the sheer beauty of all the tropical sea life. 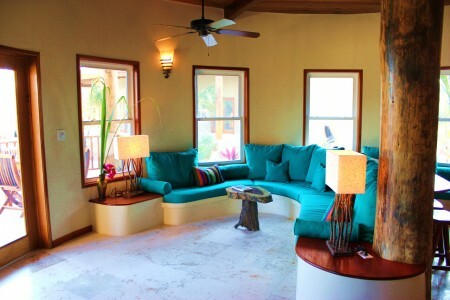 The property itself is brand new but has the feel of comfort with the many tropical wood finishes and furniture. We only stayed 6 days but are planning to go again Nov. 2012 and want to stay longer”. A perfect villa – “Indigo was an ideal villa for our family holiday. Most of all we loved the location right on the beach, throwing open the doors in the morning to see the dawn bouncing off the sea just meters from our bedroom, and pelicans and herons wading in the still clear water. The pool was fabulous, the kids loved it. Stunning views out to sea, and shade if you want it under the palm trees. The villa had everything we needed, very comfortable and loads of space for our family of four. Everything was in great shape and spotlessly clean. It was a fabulous base for exploring the Caye. We frequently took the river bus or taxi to take us into San Pedro or further up the island, and took snorkeling and fishing trips to the reef just minutes out to sea. Shark Alley and the Marine Reserve are just 30 mins or so by boat and provide some of the best snorkeling we’ve experienced. You can also walk up or down the beach to a number of restaurants and resorts, and the (expensive) grocery store is just a few minutes walk away”.